Stainless steel front and top. Stainless steel doors with double pane windows. Dimensions: 38”w x 43”d x 58”h. 54,000 BTU/hr. burner per deck. 1/2 H.P. two speed oven blower motors: 120/60/1 with 6’ cord and plug. 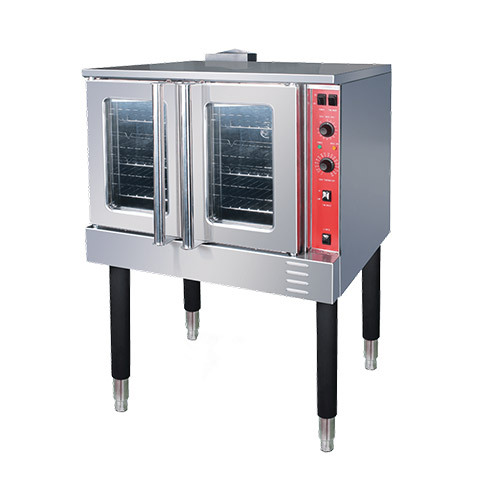 Solid state adjustable controls adjust from 150°F to 550°F. Oven Interior: 28.7”w x 25.6”d x 19.7”h. 60 minute timer with audible alarm. Oven cool switch for rapid cool down. Porcelain enamel on steel oven interior. Three oven racks per deck. A leading provider of Restaurant Equipment and Commercial Kitchen Equipment in Greater Vancouver, and throughout British Columbia. Competitive prices, fast shipping across Canada. Subscribe to our mailing list and stay updated on the latest products and special offers!